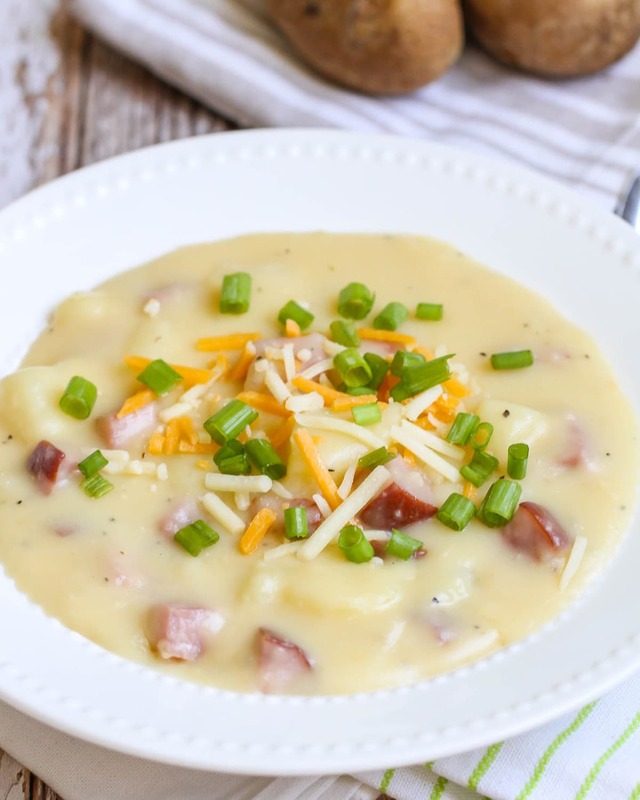 This Cheesy Ham and Potato Soup is simple and DELICIOUS!! It’s one of our new favorite soup recipes to make after thanksgiving with all the leftover ham. 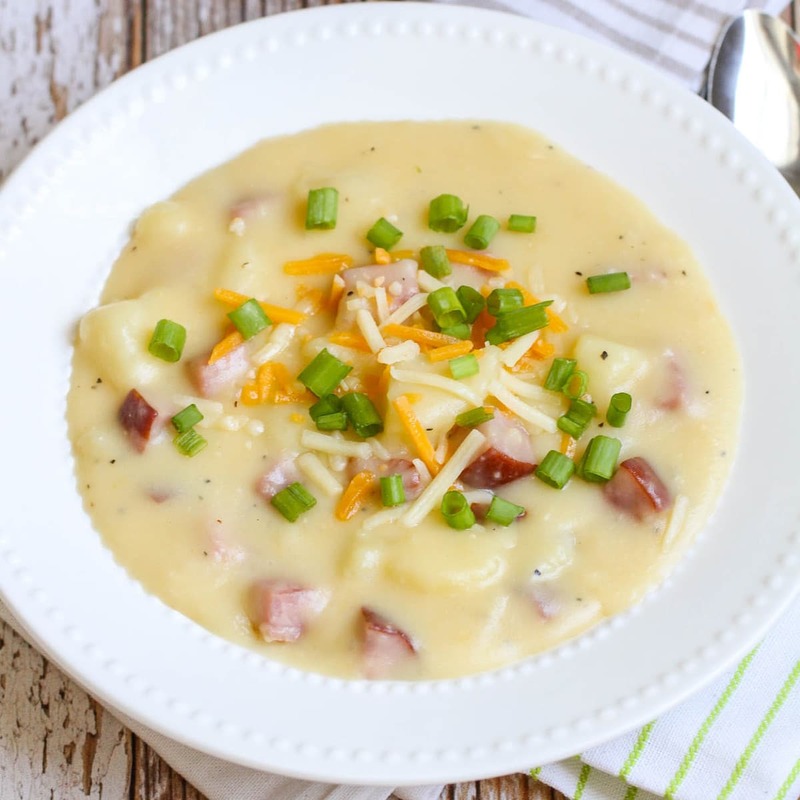 With potatoes, ham, cheese, scallions, and yummy spices, this soup is FULL of flavor! It’s no surprise that my family LOVES soup. It’s just something us Lunas have always enjoyed which means, we LOVE trying out and find new soup recipes that we love. 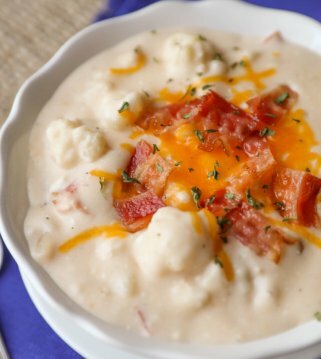 For the longest time, we’ve been making this Crock pot Cheesy Potato Soup, because it’s easy and ALWAYS a hit!! I wanted to try another Potato Soup recipe, but thought I’d try one that had ham in it, hoping it would be just as good as our old potato soup recipe. I’m happy to report that this Ham and Potato soup really is delicious! It takes a little more time than our other Potato soup, but it tastes PHENOMENAL. I asked the hubby which one he liked better and he couldn’t decide since they are both so good! I feel like this one was a little more cheesy and hearty with the ham chunks, so if you love hearty, warm soups, I suggest trying this one. For only having a handful of simple ingredients, this ham soup really is sooo flavorful! I don’t think you’ll be disappointed! Not only does it have simple ingredients, but the process for making it is just as simple! It only takes about 30 minutes from start to finish. 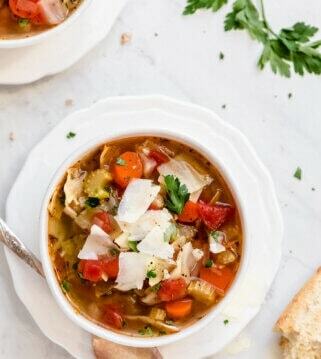 I’m all about having quick soup recipes on hand for weeknight dinners! Combine potatoes, ham and water in a large pot and bring to a boil. Cook on medium heat for 10-15 minutes (or until potatoes are tender). Add chicken bouillon cubes, salt, and pepper then mix. In another pan, melt butter on medium heat. Whisk in flour and stir constantly for about 1 minute. Slowly add milk and continue whisking until sauce thickens (about 3-4 minutes). Add the milk mixture to your pot and cook soup until heated through. Add cheese right before serving, and top with scallions. Serve immediately. 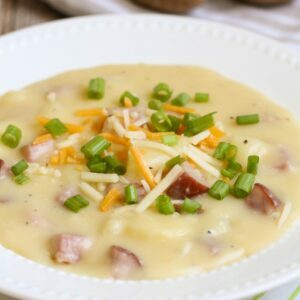 This Cheesy Ham And Potato Soup Is Simple And DELICIOUS!! It's One Of Our New Favorite Soup Recipes To Make After Thanksgiving With All The Leftover Ham. 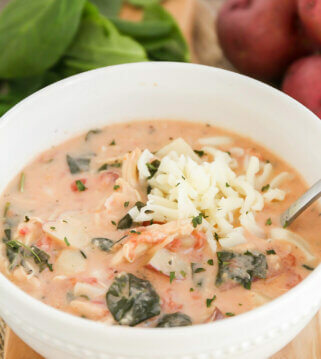 With Potatoes, Ham, Cheese, Scallions, And Yummy Spices, This Soup Is FULL Of Flavor! Combine potatoes, ham, and water in a large pot. Bring to a boil, then cook on medium heat for 10-15 minutes (or when potatoes are tender). Add chicken bouillon cubes, salt and pepper. Mix. Add cheese right before serving. Top with scallions. Serve immediately. Well, then, I’m about to join you Luna’s for din din!! 😀 The soup looks fantastic! My family is also a soup family! This is going into my rotation for sure! Aren’t soups the best?! Thanks for stopping by! We love soup too – especially when it looks like this! Comfort food at it’s best! Wow this soup looks so thick and creamy. Just how I like them. I need to start cooking some soups soon! As the weather starts to cool down, I begin craving nothing by soups! Yes, that photo totally makes me hungry! I’m right there with you! Still waiting for it to col down in Houston! Ham, cheese, potatoes! I am all about this soup. No wonder it’s a hit at your house! I love this soup recipe. It looks absolutely perfect. Made this with the leftover Christmas ham and it was a HUGE HIT!! Made a huge batch and froze what was left, added corn to half of it for a little added treat 🙂 So simple and so yummy. Thank you! 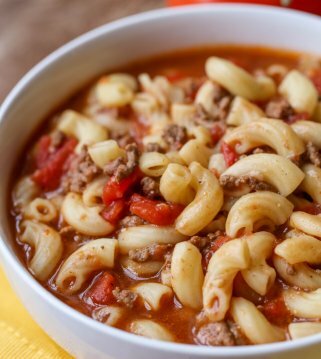 Good, hearty soup. I used ham broth instead of chicken bouillon, dried onion flakes, threw in some tasty corn, garnished with fresh parsley. Good way to use leftover Christmas ham and broth! Made a big pot and will freeze leftovers. I did the same thing with the ham broth. I added some red pepper and threw in a bay leaf. So you do not drain off the water used to boil potato and ham, right? No, potatoes will absorb most. Hope that helps!! Thanks for the recipe! I added to it by sautéing onions and garlic with the cubed ham before adding potatoes and water. I also used about a cup of stock instead of bullion just because I didn’t have any on hand. Cooked a little longer than recommended for the consistency I wanted, but followed everything else you have here. Look it very delicious! I like it! I will make it follow instrction in your post. Thanks your post! I asked the hubby which one he liked better and he couldn’t decide since they are both so good! They are!! Thank you for letting me know! It is super tasty 🙂 I’d love for you to try it! Thank you! Woohoo!! Thank you so much! Love,love your website, so happy I found you. Signed up for your emails. Making your Tomato soup Sat for a gathering at friends house. Oh, it is 🙂 I can’t wait for soup season!! Thank you! I made this for my son and he absolutely loved the soup. Yay!! I am glad he did! Thank you for letting me know! This soup was so creamy. My kids who normally don’t like soup ate it right up. Your site has quickly become one of my favorite places to find new, easy and most importantly yummy recipes. This is MY kind of soup. Creamy and cheesy and easy to put together. Thanks for another simple recipe that tastes great! This soup was fantastic!! I love the pieces of ham & potato chunks!! It was filling & my family loved it!! i TRIED THIS soup tonight and loved it! Lots of flavor. Can’t wait for leftovers tomorrow! I am so glad you liked it! Thank you so much for sharing that! 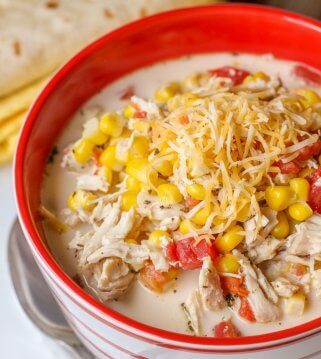 We love soups. Especially ones that take no effort. Soups are designed to trow in a crockpot and leave. Great for a cold winter night. Very delicious soup! I added gouda. Have you frozen with success? Just want to say that yesterday i tried potato soup and it was actually amazing. I am so glad you think so! Thank you for sharing that! 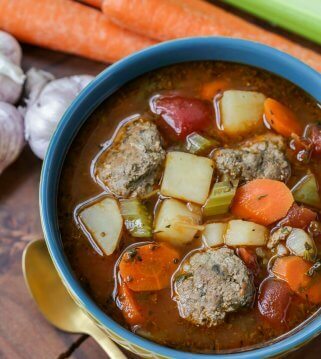 I am just in love with this soup…i often try it on week ends. That makes me happy to hear! It’s a good one 🙂 Thank you!